The California Department of Tax and Fee Administration (CDTFA) is in the process of modernizing their online sales tax filing system. Beginning May 7, 2018, sales and use tax accounts will be moved to the CDTFA’s new online system. Many TaxJar customers have received email notification of this change, and we’ve had questions from TaxJar customers rightfully concerned about whether these requests are legitimate or some sort of phishing attempt. Rest assured, California really is updating their system, and all online sellers who currently file and pay California sales and use tax online should follow the instructions to update your login details. Also, if you use TaxJar to AutoFile your sales tax returns, you will need to take a vital extra step. If you have previously filed and paid sales tax online through California’s online portal, your current User ID and Password will not be valid in the new system. We recommend updating your new login details as soon as possible because you will be required to wait 7-10 days for a mailed login code. Scroll down and click the gray “View Accounts” button under the “View or Manage Your Accounts” heading. Over the next two pages, you will be prompted to enter your identifying information and request a security code. Keep in mind that only the account owner (not a 3rd party, employee, etc.) can request the necessary information. Please request a security code and allow seven to ten (7-10) business days for the code to be delivered to your business mailing address. You will be prompted to enter your security code. From there, you should be all set to continue filing your California sales and use tax returns online. If you use TaxJar to AutoFile your California sales tax return, there will be an extra step once you have received your new code from the CDTFA. Your Dashboard will now say that your CA AutoFile enrollment is “Pending,” which means your updates are in the queue for our Filing Team to confirm the new details are accurate. This typically takes a few business days to process, though it may take a bit longer due to the volume of California enrollments that need to be reviewed again. 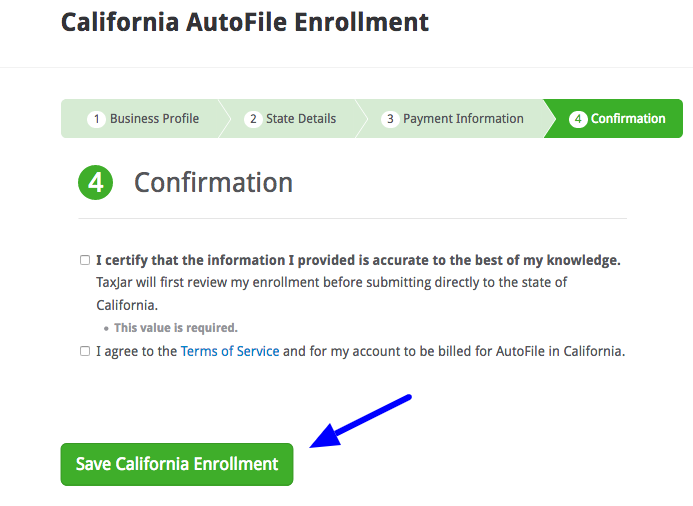 After your enrollment has been reviewed and confirmed by our Filing Team, you’ll receive an email confirmation that you are now enrolled in AutoFile for California (again). Once you receive that email, your CA enrollment update will be complete! I hope this post has helped you update your login credentials with the California Department of Tax and Fee Administration (CDTFA). If you have any questions or comments, start the conversation below or in our Sales Tax for eCommerce Sellers Facebook Group.